Making projects possible and showing them on a large stage: that is crowdfunding in a nutshell. Therefore, we are proud of the new, innovative crowdfunding platform of Maastricht University: UM Crowd. However: what is crowdfunding exactly and what is going to happen? Crowdfunding means ‘funding by many people’. In other words: people achieve something together and have one common objective. The combination of all individual contributions eventually makes sure that a great project can be realised. A perfect example of ‘Community at the Core’, isn’t it? UM now uses crowdfunding too. Scientific and student projects can sign up via UM Crowd. We are looking for concrete, societal and engaging projects, which are appealing to a large crowd. The first project of UM Crowd is project Minervalia. A small book of great value: the oldest comedy book printed in Maastricht. Worldwide only five copies are known. 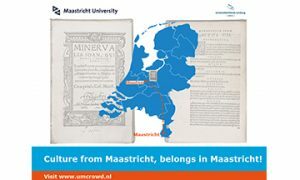 The University Fund Limburg/SWOL and the University Library want to make sure that the book can travel through this region and dedicate it to research and education of UM. All help is appreciated in order to bring the Minervalia, which is in an antiquarian bookshop in Houten now, back to Maastricht! Will you help us via www.umcrowd.nl?